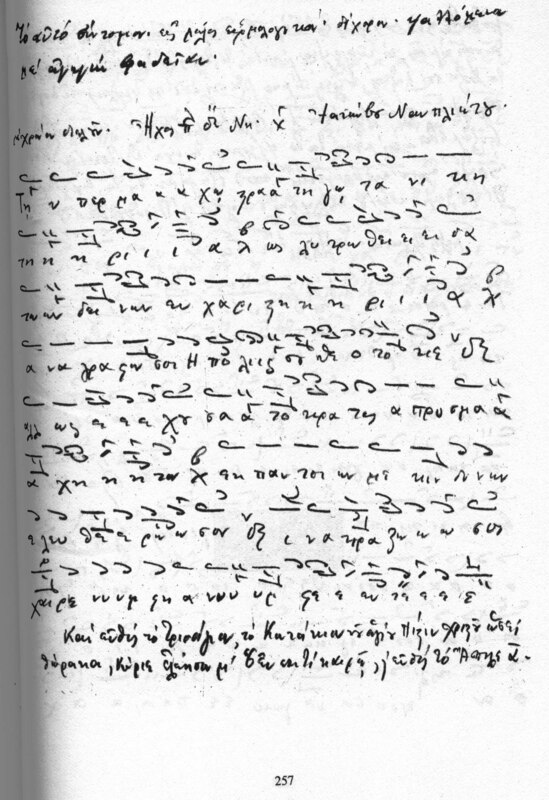 Written by his student and Domestikos, Angelos Boudouris. Boudouris explicitly writes that a slow tempo is to be used for this particular version he wrote down. He also specifies that the chronos to be used is double (diplous) as opposed to other pieces which he indicates they should be chanted in chronos simple (haplous). Notice the subtle but noticable interpretation of some petastai signs in the text. Also notice that he doesn't follow exactly the analyseis recorded in Boudouris' score. Finally notice that the co-chanter (Pringos) does small variations of analyseis here and there without that destroying the coherence of the chant. The piece can be chanted at various tempos (fast, slow) depending on the occasion/time in the service. Notice how they don't do the oxeia (jump) in the beginning. The whole interpretation is much simpler and dryer, compared to Nafpliotis above. Same comments as in Nikolaidis/Emmanouilidis' recording. See comment referring to the Greek Byzantine Choir below. Notice the double petaste in "Ina kra-". A trademark of Karas' style. Notice the identical performance style compared to the previous choirs. Not so extreme elxeis though. Speculative reconstruction from the 13th c. ms performed by mostly Western-trained musicians. The intervals of this performance sound to me quite westernised. The melody is close but different from the Greek at places. The intervals of this performance are completely western. No ornamentation at all. Notice however the preservation of the skeleton of the original melody in the English adaptation.